The number of children living in bed and breakfasts after their family became homeless has almost doubled in three years, according to new figures. Some 262 youngsters were in such accommodation on 31 March, up from 234 last year and 142 in 2002. The Scottish Executive said last year that children should only be housed in B&Bs in exceptional circumstances. Nationalists said the figures were a "national disgrace" but ministers said new laws were taking effect. The executive figures showed that there were 57,000 homeless applications last year, up by 1% on 2004. More than 60% of the applications were from single people, while 24% came from single parents. More than 70% of those assessed during the year were classified as homeless and almost 30,000 were found to be in priority need. The proportion of those with a priority need who were offered permanent accommodation rose from 60% to 72%. There was a 15% rise in households who were in temporary accommodation in March this year, to more than 7,500. 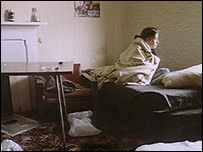 More than half were put up in local authority accommodation, with 21% in bed and breakfasts and 21% in hostels. The figures showed that more than 80% of the 2,373 households with children who were placed in temporary accommodation were in local authority premises, with 7% in B&Bs. Scottish National Party housing spokeswoman Tricia Marwick said: "Once again we see that the executive talks a good game without following through on its promises. "It is a national disgrace that families with children are being forced to live in B&B accommodation and this situation must be addressed as a matter of urgency. "Everyone has the right to a secure, warm home they can afford, but these figures show that this is not the reality for a significant number of people in Scotland." However, an executive spokeswoman said: "What these figures show is how many families were in that kind of accommodation but they tell us nothing about the personal circumstances of these families or how low they were there." The Conservatives' communities spokeswoman, Mary Scanlon, said homelessness applications had risen by 39% since Labour came to power. "The real figure is estimated to be higher still as there are many more people sleeping rough who make no appearance on official statistics," she said. Communities Minister Malcolm Chisholm said the figures showed that new legislation was taking effect. He welcomed a slowing down in the rate at which homeless applications were increasing. "We are determined to prevent and tackle homelessness, including repeat homelessness, and it is encouraging to see that more people are being housed in permanent accommodation," he said.